Three very different types of dance but with a common element, Bellydance. 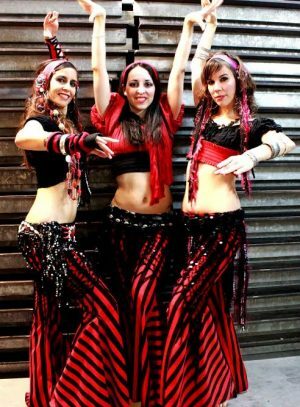 Oriental dance is a dance that combines traditional elements with other Middle East North Africa. It is characterized by its smooth and fluid movements, dissociating and coordinating both the different parts of the body. Dance Tribal ATS (American Tribal Style), was established in San Francisco and was inspired by the dances of ethnic clothing of communities in the Middle East, North Africa and the Mediterranean, he created his own version of belly dancing with a basic vocabulary It is the basis of the repertoire of tribal style. The practice of this dance is usually a structured improvisation. A dancer assumes the role of leader and performs encrypted signals that the other dancers follow. Tribal Fusion style is a more complex and expressive than ATS tribal dance style. The music has a wider range, from traditional to more modern music. This new style opens the door to a new form of tribal, more creative, expressive and theatrical. Performances: Oct.2, 2016 at 6:00 pm and at 7:30 pm.